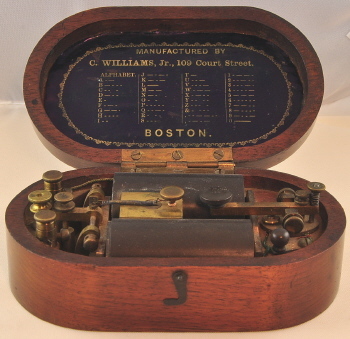 Charles Williams Jr.'s place in American telegraph history would be significant alone as an important manufacturer of telegraph instruments during the 19th century. But, it was the services he offered through his Boston machine shop to experimenters and inventors that were historic for the American telecommunication industry. Williams started out offering these services just to earn a living for himself and his machinists. Ultimately, though, it led to him becoming a pioneer in the manufacturing of telephones and one of the first telephone millionaires in the United States. Charles Williams Jr. was born in Chelmsford, Massachusetts on March 2, 1830. Early in his life his parents moved to Claremont, New Hampshire where he spent most of his school days. His father, Charles Senior, was a prominent citizen in Claremont, a staunch supporter of the Universalist Church and was sent to the New Hampshire State Legislature. The Williams family moved to Somerville, Massachusetts in 1846 when Charles Junior was 16. He received only an elementary education at both Claremont and Somerville. As a teenager he had the aptitude and an interest in the fields of mechanics, electricity and magnetism. Williams went to work for the telegraph and philosophical instrument manufacturing firm of Palmer and Hall. Thomas Hall had purchased the firm of Daniel Davis Jr. in 1849 and formed a partnership with G.W. Palmer. In 1850, when Williams was only twenty, he teamed up with Justin Hinds, who was the same age as Williams and also working at Palmer and Hall. They had similar interests and put together their individual specialties of what they were working on at that time and formed a business partnership as Hinds and Williams. They established their business at 313 Washington Street in Boston. 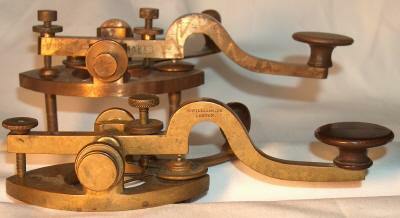 Their early ads stated they were manufacturers of both telegraph instruments and magnetical apparatus. They also advertised they were available to build models of machines and experimental apparatus. In 1856, Williams became the sole proprietor of the firm and continued to operate from 313 Washington Street for a number of years as the "successor to Hinds and Williams." Justin Hinds maintained his interests in the mechanical and electromechanical fields and continued to utilize the Williams' machine shop for his own work. Hinds later received patents in steam engine pistons and railroad signaling as a co-inventor. He also gave lectures in the 1860s on electricity and the telegraph. As late as 1874, Hinds was still advertising his services in the telegraph field and operated alone from 130 Washington Street. Charles Williams moved his machine shop on Washington Street to a larger building on 109 Court Street in Boston around 1862. Other businesses also operated at this address including a battery manufacturer, periodical dealer, clothing wholesaler and paper box manufacturer. Williams occupied the attic and a large third floor loft that was directly above a billiard hall. The main shop, located in the loft, was small and crude in all its arrangements. The interior brick walls were of a faded, dust-covered whitewash. Set up near the front and back row of windows, were 12 to 20 hand powered, metal-working lathes. There were also two small engine powered lathes. The ceiling and beams of the shop were mostly hidden by the leather belts and pulleys of the machinery. In the center of room there were wooden racks holding steel, iron and brass sheets and rods all used as raw material. On the floor, there were piles of rough castings. There was a sink were men washed up and a small forge for annealing and tempering. One corner of the loft was partitioned off for Williams' office and a salesroom where the finished instruments were on display in glass cases. During the 1860s Boston was considered second only to New York City as an established telegraph "Hub" and a magnet for telegraph inventors. 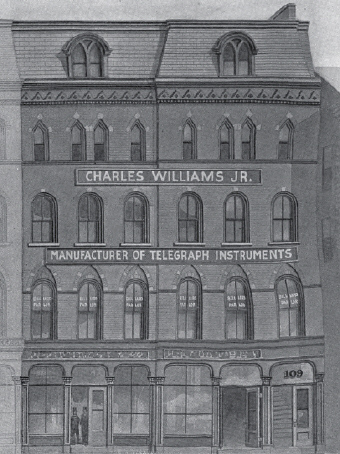 Some of the telegraph shops in Boston had been involved in the manufacturing of instruments since the 1840s. These specialized shops attracted would-be telegraph inventors with hopes that their designs could be turned into successful models. The telegraph shops of this era were divided into two categories: shops owned by the large telegraph companies and the independent shops. The company owned shops, besides building telegraph equipment for their offices, also built experimental equipment and models for inventors. But usually they were only built for inventors with inventions that would directly benefit the company. Other inventors, smaller telegraph companies, and most railroads sought out the independent shops, like the Charles Williams Jr. shop that also had the specialized machinery and skilled electro-mechanicians. There were two telegraph companies operating in Boston at this time - Western Union with four offices and the new Franklin Telegraph Co. with three. By the mid 1860s, the Western Union offices were supplied with instruments from their main shop in New York City. 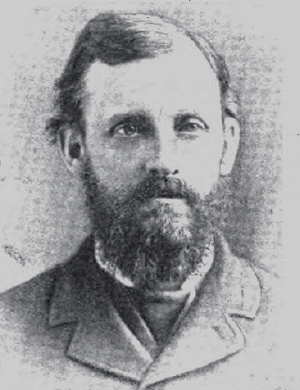 The Franklin Telegraph Company's president, Joseph Stearns, was a recognized Boston telegraph inventor. Stearns improved a design of a duplex telegraph system and put it to use on his lines between Boston and New York. Stearns and the Franklin Telegraph Co. relied on the specialized independent manufacturers in Boston for their equipment. The two largest at that time were Charles Williams Jr. and Edmands and Hamblet. 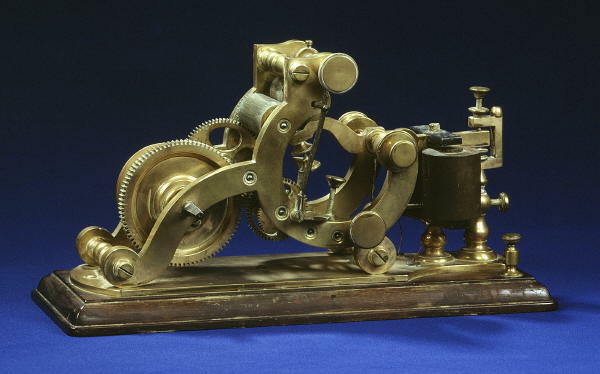 A weight-driven telegraph register by Charles Williams Jr. There were several unsuccessful inventors, experimenters and entrepreneurs who walked into the Williams shop to have their experimental designs built. Sometimes there were two or three in the shop at a time supervising the construction of their projects. But, there were a few of them that were successful and became prominent inventors of this era. One of Williams' first customers during the Hinds and Williams days was Edwin Holmes. Holmes purchased a patent from Augustus Pope who was living in Williams' home town of Somerville. The patent was for a simple electromagnetic burglar alarm design where if a door or window were to open, a bell rang in the owner's bedroom. Holmes originally went to Hinds and Williams with his newly purchased patent to have all the electrical bells and necessary equipment built. The Holmes' Burglar Alarm Company grew out of it and soon expanded to New York City, where Holmes felt there were more burglaries. Williams continued to supply equipment to Holmes for both cities for several years. Edwin Holmes' design of a central office to handle his burglar alarm monitors circuits in Boston would later be adapted as a telephone central office during early experiments with the telephone. Moses Gerrish Farmer was one of the prominent inventors and leading "electricians" of this era. A Dartmouth College graduate, Farmer conducted many experiments with electro magnetism and was involved with some of the early telegraph offices and lines in New England since the 1840s. During the 1850s. he and Dr. W. F. Channing were pioneers in developing and installing a fire alarm telegraph system for the City of Boston. During the 1860s, Farmer conducted experiments in a corner of Charles Williams' shop. He had Williams build some his experiments and Farmer educated Williams' machinists about electricity. Moses Farmer's, "Thermo-Electric Battery" was being manufactured by W.H. Remington in the same building as the Williams shop. In March of 1868, when Edison was only 21, he moved from Port Huron, Michigan to Boston. He was hired by George Milliken who was the manager of Western Union's main office in Boston. Milliken was another accomplished Boston telegraph inventor with several patents, most importantly his design of a telegraph repeater. It was during this year while in Boston that Edison made the transition from being a telegrapher to a full time inventor. Edison worked on a press wire at night at Western Union and during his off hours, worked on his projects at the Williams shop. Williams gave him the space he needed and extended Edison credit for materials and work performed by his machinists. He sometimes worked after Williams went home. While in Boston, Edison worked on a number of projects including a self adjusting relay, stock printer, and his own fire alarm telegraph. In October of 1868, Edison filed for his first patent, a vote recorder for legislative bodies. In December of 1868, he placed his first advertisement for one of his inventions and listed the Williams shop as his address. The ad was for his double transmitter, used in duplex telegraphy. There is no evidence, though, that he ever sold either a vote recorder or a double transmitter. In June of 1868, while Edison's was in Boston, the 109 Court Street building was badly damaged in a fire. It was estimated that the damage to Williams' shop and inventory alone was $3000 to $5000. The damage to Moses Farmer's expensive experimental apparatus and the battery business of W.H. Remington was estimated at $2000 each. Williams was covered by insurance, but Farmer and Remington were not. Williams and his machinists cleaned up the shop, made repairs to their machinery, and with new tools and equipment, were back in business by August. 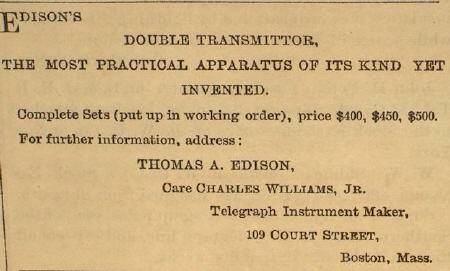 During Edison's time in Boston, he submitted articles to leading telegraph publications of the day. He signed his articles with the initials, "TAE" or simply with an "E." In one of his articles, published on August 15, 1868, he wrote about the manufacturing that was going on in Boston and gave first hand details about the Williams shop. Charles Williams Jr. Pocket Set. measuring only 5"L 3"W 1.75"H. ..The establishment of Mr. Williams is located at 109 Court Street, and though but a short time since damaged by fire, is again in full blast. Very little apparatus, except that used for Telegraphic purposes, is manufactured here, and in this particular branch the work is of a most excellent character, consisting of Repeaters, Switch-boards, Relays, Registers, Sounders, Keys, Rheostats, Galvanometers and batteries, all of which are made in large quantities. 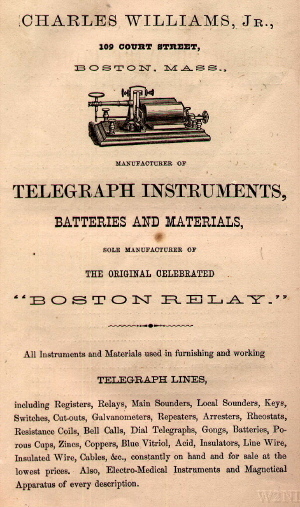 The most noticeable instrument manufactured here is the well known "Boston Relay," of which a large number are turned out weekly, mostly for use on railroad wires. Ten men are employed here. The office of the well known electrician and telegraph inventor, Moses G. Farmer, is also at this establishment. By January of 1869, Edison resigned his position as telegrapher to work full time experimenting and seeking backers for his inventions. In the spring of 1869, Edison moved to New York City. Phelps/Western Union pattern camelback key. Another interesting insight during this period was by telegraph engineer and author Franklin Pope with his report of October 23, 1869 on the exhibits of The American Institute Fair in New York City: ..Mr. Williams exhibits two relays, two sounders and a register, as well as half a dozen keys of different patterns. There is, of course, nothing especially new in principle about these instruments; but in point of elegance of design, and beautiful and accurate workmanship, they cannot be surpassed by the productions of the best European workshops. These are, beyond question, the finest instruments which have ever been publicly exhibited here. One of the popular key patterns of this era was the Phelps or Western Union pattern camelback key. They would have of been in use at the Western Union offices in Boston at this time. Several makers had their own interpretation of this key and Williams was no exception. You can see in the photo of the two keys, the strong similarities of the Williams key to the Phelps. In Part Two of this article, Human Voice sent via Telegraph, the activities of Charles Williams Jr. and his shop after 1870 are covered. journal of The Antique Wireless Association.